BATTLE FOR WORLD / WSJ – November 16, 2018: The article highlights that two U.S. food regulators have agreed to share oversight of meat grown from animal cells, moving the emerging technology closer to the dinner plates of consumers. 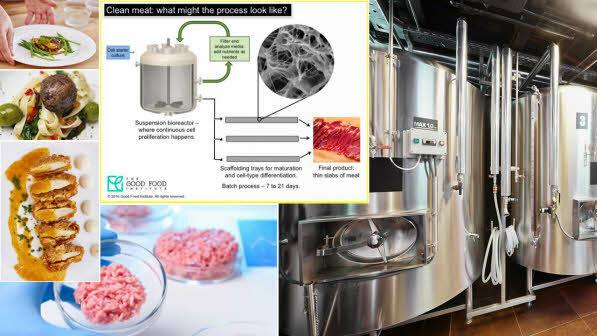 Startups like Memphis Meats Inc., Mosa Meat, Finless Foods Inc. and Aleph Farms are pursuing the cell-based technology, working to lower per-pound costs from tens of thousands of dollars into a range of meat products that consumers would be interested in to consider. The U.S. Department of Agriculture and the Food and Drug Administration will jointly oversee the cell-culture meat technology process, senior officials said Friday (November 16). The decision settles a debate between agency officials over which department would regulate the technology, while major meat companies, cattle ranchers and hog farmers are with skepticism. The cell-based meats are produced using poultry and livestock cells that have the ability to self-renew. Those cells are placed into bioreactor tanks, where they are fed nutrients and oxygen, helping muscle tissue to grow. In a matter of weeks, according to developers, the tissue can be harvested as meat and formed into products ranging from beef meatballs to chicken strips. BATTLE FOR WORLD / YAHOO – December 14, 2018: The article highlights that plant-based meat companies aren’t trying to target vegetarians, who make up a mere 5% of the U.S. population, but they’re trying to get carnivores to diversify their palates. According to Impossible Foods, makers of plant-based meat products sold in 5,000 locations across all 50 U.S. states, is one of the leading players, having forged partnerships with restaurants known for their meat dishes. Higher end restaurants like Momofuku Nishi and fast food chains like White Castle offer the alternative on their menus. “We wanted you to be able to try it well-cooked. It’s really been a case where everyone throughout the U.S. — both rural and urban locations — have embraced this idea of delicious ‘meat’ that’s crave-able … but you don’t have to compromise [taste],” Impossible Foods CFO and COO David Lee told Yahoo Finance.